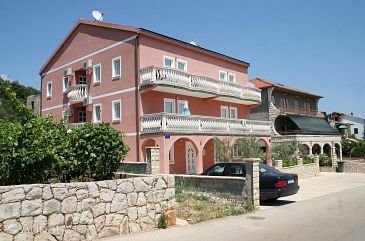 Featuring gratis wireless internet and air conditioning, Apartments Saric is located in Biograd Na Moru, 27 km from Zadar. The accommodation presents a TV with satellite channels. There is also a kitchen, equipped with an oven, fridge and stovetop. Vodice is 33 km from Apartments Saric. The closest flight terminal is Zadar Airport, 19 km from the property. Apartments Saric ~0.1 km, Biograd Na Moru price per day from € 45 Featuring gratis wireless internet and air conditioning, Apartments Saric is located in Biograd na Moru, 27 km from Zadar. The accommodation presents a TV with satellite channels. There is also a kitchen, equipped with an oven, fridge and stovetop. Vodice is 33 km from Apartments Saric. The closest flight terminal is Zadar Airport, 19 km from the property. Apartments Ivan ~0,2 km, Biograd Na Moru Situated 800 metres from the beach and the centre of Biograd na Moru, Apartments Ivan presents self-catering accommodation with air conditioning and free internet access. Free on-site car parking is provided. All apartments comprise an outdoors terrace with seating area, a fitted kitchen and a toilet. A shared back yard with grill amenities is at guests' disposal. Some eating places can be found within 100 metres, as well as a grocery shop. Bus Station is 800 metres from the Apartments Ivan. Zadar Flight terminal is at a distance of 30 km. Banić apartments ~0,1 km, Biograd Na Moru Providing a back yard, Banić Apartments is positioned in Biograd na Moru. Gratis wireless internet access is provided and the closest beach is 600 metres away. The river Zrmanja, offering rafting possibilities, is 50 kilometers away from the property. Šibenik is 42 km from Banić Apartments, while Vodice is 33 km away. Turanj ( ~ 4.6 km ): 60+ accommodation units. Pakostane ( ~ 5.4 km ): 74+ apartments. Drage ( ~ 9 km ): 40+ apartments. Sveti Petar ( ~ 9.6 km ): 75+ accommodation units. Beach Bosana, Biograd ~ 1 km from Apartments Saric Gravel beach: ideal for families, recommended for young people, with restaurant, with caffe bar. Excellent choice of watersports. Beach Drazica, Biograd ~ 1,2 km from Apartments Saric Gravel beach: ideal for families, recommended for young people, awarded with blue flag, with restaurant, with caffe bar, equipped with showers. Excellent choice of watersports. Beach Soline, Biograd ~ 1,2 km from Apartments Saric Sandy beach: ideal for families, recommended for young people, with restaurant, with caffe bar, equipped with showers. Excellent choice of watersports. Beach Kumenat, Biograd ~ 2 km from Apartments Saric Gravel beach: ideal for families, with caffe bar. Beach Iza Banja ~ 2,9 km from Apartments Saric Sandy beach: ideal for families, recommended for young people, awarded with blue flag, with restaurant, with caffe bar, equipped with showers. Excellent choice of watersports.